Showcase stunning visual, interactive art forms through the 26 note metallophone Swirl. At 54-14" long and 56-3/4" tall, Swirl delivers an exceptional sculptural form and musical presence that creates always in-tuned, pure, soothing sounds. Producing tones ranging from soprano to alto, its vibrant display of chimes in an upright swirl arrangement with two disparate colorations that delineate the variation in keys—gold plays in C major, silver is A minor. 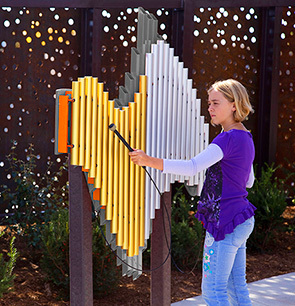 Developed with anodized aluminum chimes, individual aluminum resonators and HDPE frame, this charming outdoor musical instrument is built to withstand seasonal conditions and frequent vigorous play. 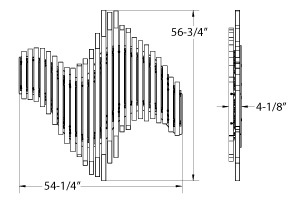 Swirl creatively accommodates a variety of applications offering popular installation options.